I think it was soon after Season 2 finished airing that I watched Season 1 of “Arrow” on NetFlix and then Season 2 on Blu-Ray before the recent 3rd season began. 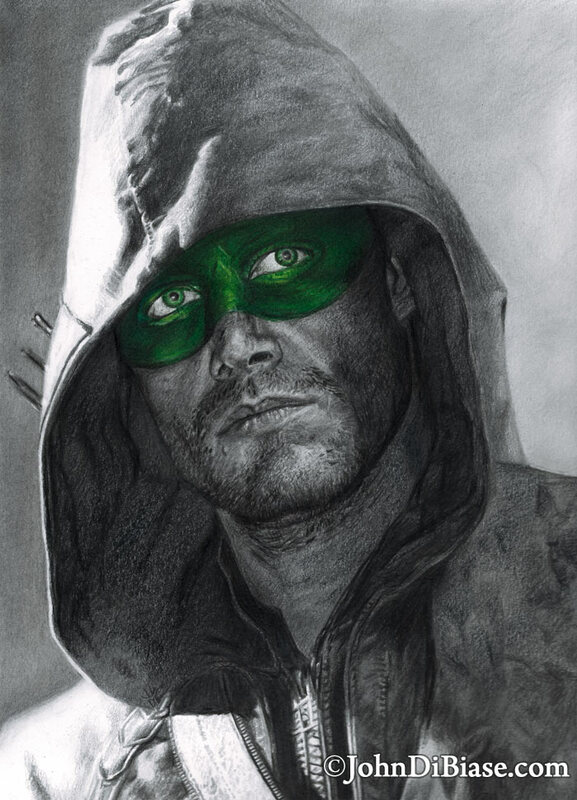 While the first season was a little TOO rife with teen-style drama, by now the show is in full-fledged crime/superhero action, and I felt inspired to draw Stephen Amell in costume. However… well into the drawing, I realized I was using paper I did not prefer to use. I’ve gone away from the “vellum” Bristol paper and have just been using “Smooth” Bristol (easier to get fine detail), and the two pads look almost identical. Anyway, it is what it is. I used mostly graphite — even drew and started coloring in the mask with graphite (deliberately, to find its shape), and then erased it to color it in colored pencil. I also experimented with using more black colored pencil on top of the graphite to get the areas darker where needed.